This is the first in a series of blogs from Wes Sparling, VP Marketing Strategy, which we are informally calling “Wednesdays with Wes.” In this series Wes will look at the role of data and strategic planning in successful direct marketing campaigns. Much like martial arts or gourmet cooking, marketing is a discipline that is both a science and an art form. It’s only when you combine the human components, such as motivating copy, with the scientific elements, like analytics, that you obtain optimal results. Data, and how you use it, falls on the scientific side of the process. Let’s talk a moment about what we mean when we say data. The term data can refer to something simple like the postal address of a recipient, or it can be much more robust and include every element known about a prospect or customer. This list can be extensive, including the person’s transactional history with a particular company or their interests in a particular product or service. Demographic data, psychographic data, credit level data—these are all types of data that marketers can use to improve their messaging. Each of these types of data can contain a wealth of knowledge about your prospects that can give you clearer insight into their lifestyle and habits. When properly extracted, this knowledge can be used to empower a marketing campaign. Although data is part of the science of marketing, it helps to inform the more human aspects as well. Without data, you are blind to what your prospects care about and what they are likely to be motivated by. You end up using valuable marketing dollars to engage in customer research and testing far more often than you may need to. You also run the risk of saying the wrong thing and hurting your brand, diminishing the probability that this prospect will respond to future communications. Carefully examining consumer data and incorporating the insight it provides into your marketing plan gives you a finer lens with which to view your customers and appeal to them on a deeper level. For example, if a marketer wanted to sell “green energy” (power sourced from environmentally-friendly sources such as wind and solar) it would certainly be helpful to understand whether their target audience has an interest in preserving or protecting the environment. If they do, it is reasonable to assume they may have a greater interest in “green energy” than someone who does not have that type of concern. In fact, this sort of “data” can be used both to narrow a campaign’s scale (by mailing only to those who have been shown to have an interest in “green energy”) and to empower the messaging. In this instance, copy could be written that speaks to the recipient’s interest in environmental causes. The mailing piece may open with a headline like: “You know how important it is to protect our fragile environment, now you can help do your part by switching to Simply Green power. Simply Green is power that has been generated from 100% environmentally-safe methods such as wind and solar.” In these few sentences, you appeal to the recipient’s sense of duty, acknowledge their environmental concerns and offer a solution. 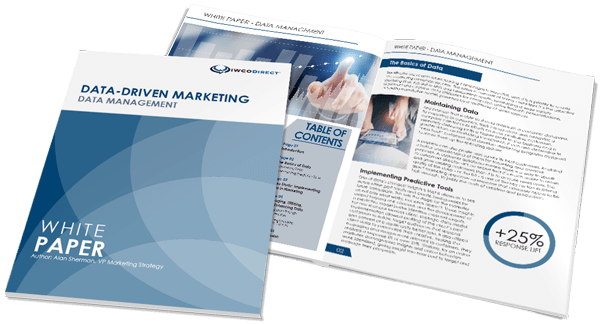 At the end of the day, marketing strategy is almost wholly informed by the data you have. The more you know, the more you increase your chances of success. Effective strategy means targeting audiences that are interested in what you have to offer and sending them campaigns that communicate to them in ways that they identify with. The ability to do that level of targeting starts with data. Be sure to stop back next Wednesday when we discuss how to find the right data for your campaign.